Why Does Eating Dairy Cause Cystic Acne? Updated 12/1/17. Your skin acts as an excretory system to get rid of substances that don’t agree with your body. For example, if someone is allergic to shellfish, they will break out in hives all over the body but it’s not like they rubbed shellfish topically over the skin. The hives is the symptom of your body trying to rid itself of this allergen. In the case of eating dairy, it is mucous forming and can be difficult for the body digest—which is why many people are lactose intolerant. For certain people, when they get too much dairy for their body to digest, it may come out in the form of cystic acne (hard, painful bumps under the skin) on the chin and jaw line area. Why the chin and jaw line area? The hypothesis is that since the majority of milk in the U.S. comes from pregnant cows (and some cows are given growth hormones), the hormone levels in milk may play a role in excess sebum production, which promotes acne. Sebum production is influenced by androgens and hormonal mediators, such as insulin-like growth factors found in milk and other animal products. 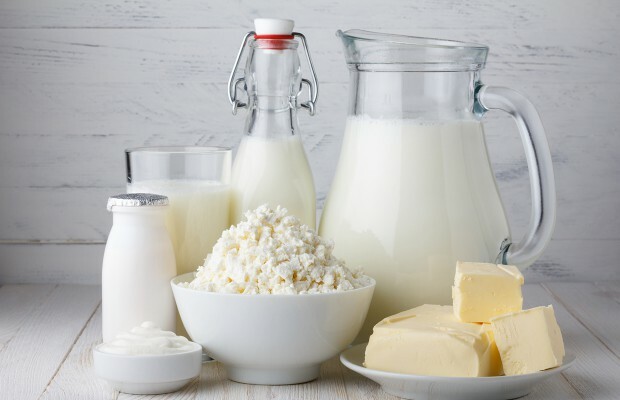 The consumption of milk, cheese and yogurt may become factors that influence endogenous hormones and mimic the hormones that trigger oil production in the skin to ignite the acne process. The body may use the chin and jawline area to remove these excess hormones. There are a greater number of sebaceous glands in the face and since hormones are fat soluble, the body will use these glands as an avenue of excretion for fat-based hormones. 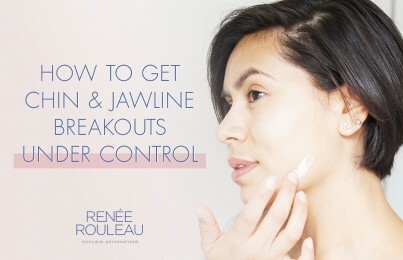 Read theses 8 tips for preventing chin and jawline breakouts. 1. Get a cortisone shot injected into the cyst by a dermatologist. It definitely works, but you run the risk of a possible skin indentation. Read more about cortisone injections. 2. Start taking oral medications such as antibiotics or what is formerly known as Accutane. I personally believe that medication should be the last resort. After all, for some, it can act as a band-aid in that it can temporarily help, but when you go off of it, it may come right back. It’s always best to see if you can find out the underlying cause. Here’s 11 common causes of blemishes. 3. Dab on Anti Cyst Treatment immediately when the cyst forms. This can dramatically flatten the visible appearance of the bump by about 50% more quickly than when using nothing at all. It has been truly a miraculous product for thousands of our customers since I developed it it 20 years ago. Along with Anti Cyst Treatment, you can get three other of my best blemish spot treatments in this Zit Care Kit. 4. Try cutting out your dairy completely for two weeks and and see if that improves the condition. In my 30 years of being a esthetician and skin care expert and working with clients hands-on, I have literally “cured” many of my clients cystic acne condition simply by suggesting they reduce or cut out their dairy intake. I recommend cutting it out for at least three weeks to see if dairy may be the underlying cause. I totally agree that it’s the hormones. There are studies that show a arise in plasma estrogen and progesterone after drinking milk. Pregnant cows can have 10x more hormones in the third trimester than after pregnancy. In nature, it is not common to drink milk from a pregnant animal. Does Lactose free milk also cause cystic acne ? Yes, it can for some people. Does the chin and jaw line also include the neck? I seem to get the cystic acne on my neck just under my chin when I have dairy, but I don’t usually see the neck listed as a problem area with dairy so I am wondering if acne on the neck could also be from dairy products? Thank you! Yes, the neck most definitely is a part of the jawline and dairy can cause cysts in that area. Has anyone tried taking lactose pills to prevent cystic acne? I’ve tried and I don’t get cysts, however it seems to cause digestive issues. I am sooo glad I ordered the Anti-Cyst Treatment! I am 45 & for most of my adult life, I’ve gotten at least one acne cyst regularly with my cycle – ugh. Truthfully, I purchased this because I had never seen a product that was specifically created for cystic acne. My thought was, if it turned out to be half as good as the testimonials, I would be happy. It arrived yesterday, I applied it ONCE, & it has worked wonders! Woke up this morning w/significantly reduced redness on ALL spots AND the scab is GONE on the newest one! This stuff is amazing & it only takes a tiny amount! I almost can’t wait for a new one to begin to see how it does! Well… almost 😉 I am incredibly impressed! So glad I took the plunge & bought the Basic Collection too, I have very oily skin & hours after using it my face feels so nice. My only regret is that I didn’t purchase the Balancing Skin Tonic with it. Thank you for creating & sharing your wonderful products with us! I am so very grateful to you Renée! Thank you so much, Kim!! 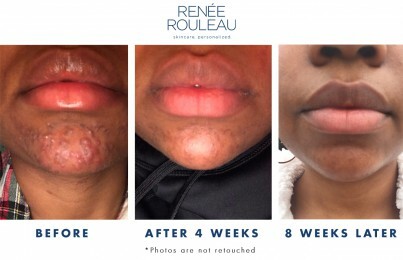 Stick with us, we’ll take good care of your skin!! Hey I am 27 and have had bad acne once before in my life when I was 24. Then I had gone on antibiotics and creams from the dermatologist and it cleared up. But left my fair skin more sensitive and irritated as before. So 6 months ago(27 yrs old) when I started getting horrible acne mainly on my cheeks and jaw, I was hesitant to go back on antibiotics and harsh creams because of the extreme sensitivity of my skin. I went to the health food store where I was recommended a total body cleanse (cleansesmart) while taking it my acne cleared up but as soon as I stopped it started again. At first I thought It was something in the cleansesmart pills that cleared my acne. Then through research and realization. I realized it was because the cleansesmart program told me to restrict things like dairy, gluten, and sugar in order for them to be effective which I did. Also it was easy because the cleansing pills reduce hunger and craving. As I researched online I read more and more about dairy being the culprit and it made sense. So with acne popping up again instead of doing another cleanse I decided to try cutting out all dairy. And surprised it worked! Kind of sad because it was my favorite food group but at least I found the culprit.Now my question is why at 27 would dairy all of a sudden give me such bad acne when it hadn’t the rest of my life??? Also to note which may answer my question is that as I am getting older my skin is becoming more and more sensitive, red, irritated and itchy. Even without dairy consumption, the pimples go away but the flared up skin doesn’t. I’m pretty sure personally I might have mild rosacea as well. But see no benefit in going to a dermatologist when they will just put me on a bunch of stuff that masks the symptoms and destroys my skin. Great question, Ashley. The reason why dairy is NOW an issue for you is simply because your body is changing. I hear this ALL THE TIME from clients. It’s very common that your skin and body can completely do one thing and out of the blue, it just switches gears. So for now, and do know that it won’t be forever, your skin just isn’t responding well to dairy. As for your sensitive skin, take our Skin Type Quiz to get products recommended to help manage it and get it looking its best. And of course, check out our Anti Cyst Treatment for times when you overindulge in dairy. If your thighs touch together when you walk, the friction could cause some bumps. Generally ice is better to reduce inflammation for cysts. I have suffered from cystic acne for quite some time and just came across your site after hearing about the dairy correlation from another source. However would you say that it’s the dairy component that causes the acne or the fact that a lot of the cows that produce the milk have been given extra hormones and growth factors and thus drinking milk that isn’t organic causes the acne. I want to try out and see if this is the case and is what is causing my acne around my jaw line but I love love love yogurt.. So I buying organic yogurt and milk would have the same result as cutting out dairy in general that would be great! Thanks for your thoughts! You’ll just have to experiment, Kristin but most people who are intolerant to dairy cannot even eat organic dairy. I would first recommend cutting out all dairy for two weeks and then maybe slowly work it back in once you see how your skin responded to no dairy at all.